Authentic Tipis nestled in the trees with fire rings and grills. Two Camping cabins also with fire rings and grills. And a fully-equipped 3-bedroom log house with deck, kitchen and baths. Camping Cabins are pet friendly. This was our favorite campsite site of our two week road trip. Wish we had booked more than one night. Nice lots - clean and level - not huge but enough - quiet and all other campers friendly including the long timers. Lots are positioned to maximize shade when sitting outside the RV. Manager escorts you in a golf cart upon arrival to your location and helps you position the RV - a nice touch. Kids enjoyed playing in the pond. The only downside was the $1.25 for the shower - most other sites seem to be free - but with that said - this was less expensive than those sites and they do explain that they are on a well. Some reviews complain about the WiFi but we didn't have any issues - they give good instructions and have two WiFi access point options. During a full 1 week stay: The Internet was almost completely useless, in order to get any service a very early morning although short-lived attempt allowed for email and nothing else. This made research for the area impossible. We found the restrooms clean but the showers were fee based - not the end of the world, but not fully disclosed either. There appeared to be several permanent residents in the park so the normal social interaction we enjoy wasn't as nill. Last clarification - the swimming is a backed up creek and sand bar. On a positive note, well kept grounds, useful center common area and functional nice grill, bathrooms were clean, the store close by was useful for the odds and ends one needs, and the proximity to the Redwood Forest was about perfect. Spend the night in a Tipi, a Cabin or 3-bedroom Log House! 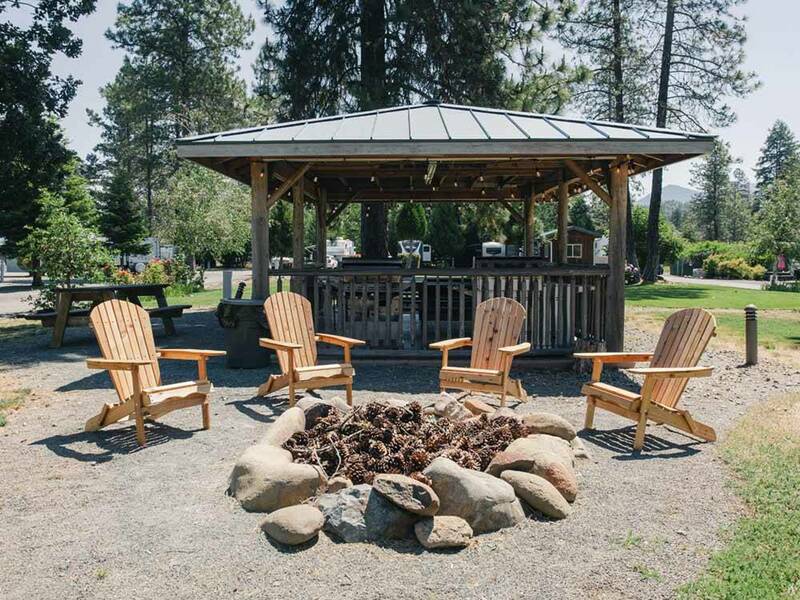 Tipis & Cabins are set in our woods & have grills & fire rings. Bring friends or family & luxuriate in our 3-bedroom log house. Take a dip in our swimming hole. 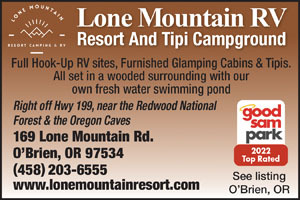 Explore Oregon Caves, the Redwoods & local wineries.